Fancy driving a despot’s old car? Have you ever imagined the secret thrill of driving along in a despot’s old car? No, I guess you probably haven’t but, hey, maybe you should start. This thought came to mind the other day when I was reading about how a former African head of state’s battered old Mercedes 600 was sold for £445,000 at auction. Now, I have no idea if the guy who previously owned this luxury vehicle was a ruthless dictator or one of the cuddlier types of African leaders who give hard boiled sweets to urchins and look after injured pigeons in their bedroom. 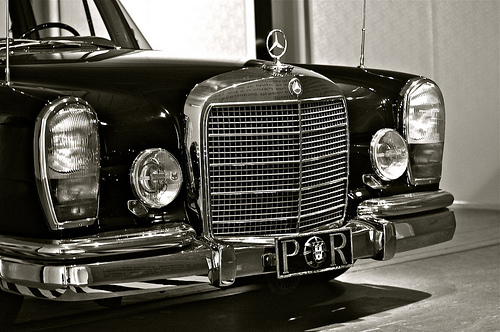 However, what I do know is that this very same model of Mercedes was used by other famous despots and rogues. Saddam Hussein? He had one. Pol Pot? Never went anywhere without his. Idi Amin? Check. Drug baron Pablo Escobar? Si. What about Nicolae Ceausescu and those North Korean leaders whose names I always get mixed up? Yup. Jay Kay? He’s got one as well. Ok, so the Jamiroquai singer might not be your typical dictator but just let him get his hands on a banana republic and see what happens next. Does this list of fans of the model put you off it at all? Well, it hasn’t put off other famous but less despotic owners. George Harrison, John Lennon, Jeremy Clarkson and even rubber faced Rowan Atkinson have all owned one at some point. The thought of Mr Bean driving the same car as Pol Pot just doesn’t sound right for some reason, does it? If we go back to the original story, the old Mercedes which recently went up for auction sat in a garage in the UK for over 3 decades after it returned from its tour of duty in Africa. It was in a pretty horrific state when it was put up for auction but that didn’t stop someone paying out big bucks for it. It is now estimated that it will cost more to get it put into a good condition than it did to buy it at the auction. Would you be happy driving an evil dictator’s old car? What about Mr Bean’s? This entry was posted in Musings, News and Views and tagged car auction, famous owners, mercedes 600 by Robert Bell. Bookmark the permalink.